I’ve been waiting to sample this years’ Jubelale.Â You see, every year, Deschutes Brewery out of Bend, Oregon comes out with their Fall seasonal.Â Each year, it’s a bit different. However, the description is always the same.Â Jubelale is a crisp ale brewed with crystal malts and enough hops to make it well balanced.Â The ale could be described as a darker ale, but not as nutty or malty as a stout or porter. On another note, Jubelale chooses one local Central Oregon artists and asks him/her to come up with the art work that adorns the Jubleale bottle each year.Â This is a great move as it features local ale and local artistry in one stroke. 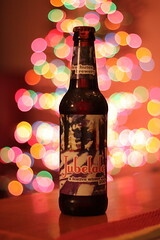 This years’ Jubleale does not disappoint.Â It’s crisp but refreshing taste compliment the holiday perfectly.Â Jubelale is a well balanced and flavorful ale that will warm you up as the season turns cold. You are currently browsing the Pints And Steins weblog archives for November, 2009.